Cut the carrot and the leek into julienne. Blanch them for 1 minute in boiling water. Cool under cold water so that they stay crispy. Cut the jalapeño into small cubes and squeeze your lemon. Remove the fishbones and cut the ling fillet in 2 or 4 equal portions. Pour a good drizzle of oil into a cast iron pan or saucepan that can go to the oven. Let the fish swim in the oil until it has a nice color: about 2 minutes on each side of the fillet. Add the slices of chorizo ​​to your pan in order to give the fish a pink color. Put your pan in the oven at 210 ° C for 5 minutes. Remove the ling fillets from your pan and keep them warm on the side. In the chorizo pan pour the lemon juice, cream and the spoon of concentrated fish stock. Mix well and cook over medium heat for about 5 minutes. Add the cubes of jalapeño, carrot and leek to your sauce, keep a bit of it to decorate your plate. Let it simmer slowly for 5 minutes, add lemon and / or salt and pepper depending on your taste. Place the ling fillet on a bed of sauce and cover it with sauce again. 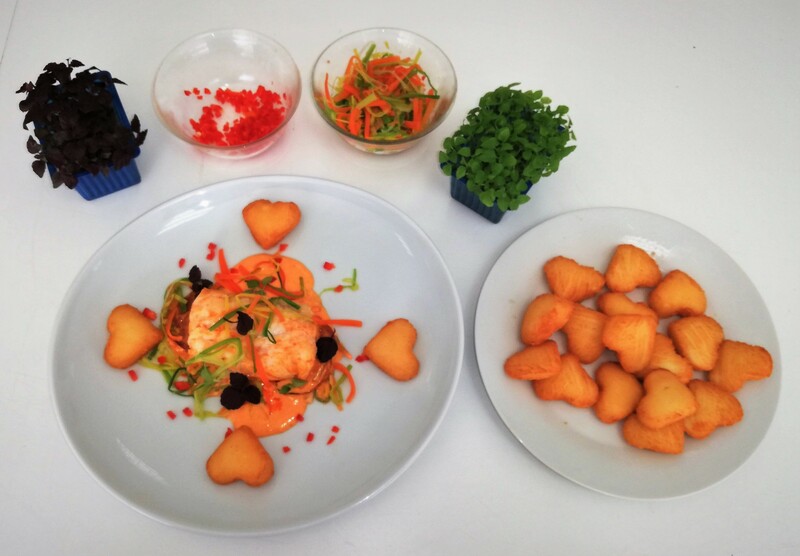 Put the romantic touch, Potato Hearts on the plate whereever you want. Tip: For a romantic plate, arrange the food on the plate with an artistic touch.